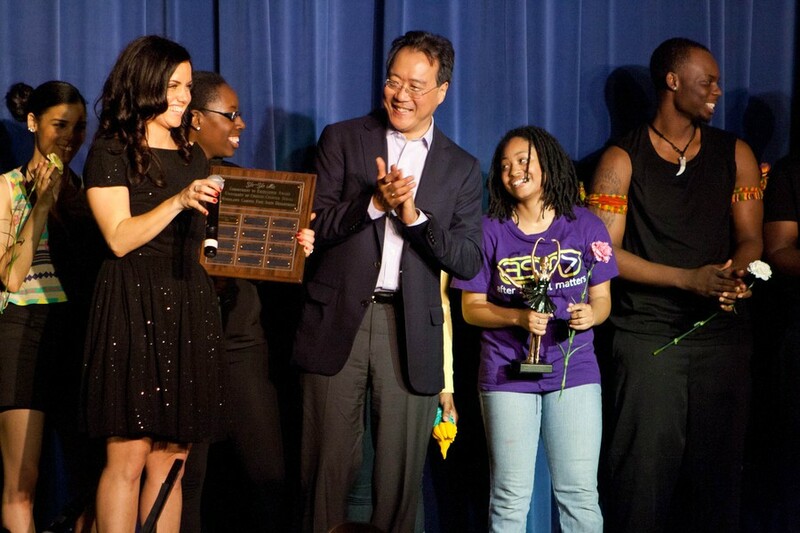 World-renowned cellist Yo-Yo Ma performed at the U of C Charter School Woodlawn Campus’s (UCW) second annual spring concert and art show on Friday evening in celebration of the students’ work in fine arts. The concert also highlighted the school’s collaboration with the Chicago Symphony Orchestra. As the night went on, students performed musical pieces and a dance medley, while student artwork hung in a gallery nearby. During the concert portion, Ma was inspired to perform the Prelude from the Cello Suite No. 3 in C Major by Johann Sebastian Bach by his work with UCW, and the students performed a song that they had composed in response to a challenge Ma posed the last time he was there: Take the school creed (which is recited every morning), and set it to music. For the past seven years, Ma has worked closely through the Urban Education Institute (UEI) to promote arts education at UCW, which enrolls students in grades six through twelve. His involvement with the school began at a lunch with UEI director Timothy Knowles and Chuck Lewis, a governing board member for the U of C Charter Schools. Since then, Ma has played an integral role in forging a partnership between the UEI and the Chicago Symphony Orchestra, where he has been a creative consultant since December 2009. “We’re trying to see whether arts integration works as a core subject. We’ve been talking to principals and teachers because we think this kind of stuff—disciplined imagination—works. This is what gets people excited,” Ma said. And arts education, Ma believes, is integral to UCW’s ability to keep its students engaged and in school. Ma has been instrumental to that success, according to Knowles. “Yo-Yo has been a conspirator in our endeavors. He has been a very big part of our work,” Knowles said. Partly due to Ma’s influence, the Chicago Symphony Orchestra has been supporting the fine arts department at UCW, bringing in musicians and teaching artists, according to UEI spokesperson Katelyn Silva. “The CSO has partnered with our school for a class. This is one piece of an academic puzzle that we’re really excited about,” she said. “We’ve been here since December and January working with them every week,” he said. The effect of Ma’s support hasn’t been limited to the music curriculum, according to UCW’s fine arts director, Ahava Silkey. The dance program has flourished as well, expanding from a nine-student affair two years ago to a full dance company with three classes and a dance studio. “We’ve come a long way in a short time,” said Lewis. Brooke Williams, an art instructor who organized the exhibit that accompanied Friday’s concert, said that the classes at UCW are likely the first time these students have been able to study art. “A lot of these kids don’t get to have art until high school,” she said. Devon Goodloe, a high schooler at UCW whose work was featured in the art show, is one example. Friday was Ma’s fourth time visiting UCW.